On the morning of August 21, Wang Hao, deputy secretary and acting mayor of Suqian municipal committee, and his party eight people visited Guangbo Group. Group president Wang Liping and other senior leaders accompanied. Wang Hao and his party visited the boutique book workshop and the exhibition hall on the tenth and the first floor. 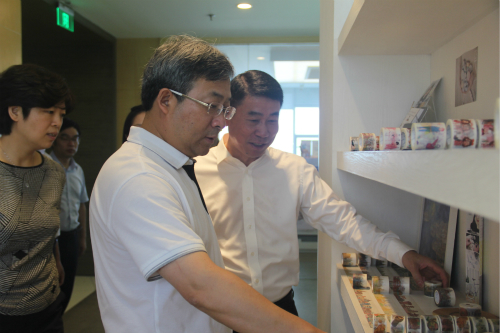 They had a detailed understanding of Guangbo’s diversified development strategies and overall industrial layout. For Guangbo’s creative stationery products, Wang Hao had a deep impression, asking about the design process, market response and other details. He showed, the spirit of daring to work hard and daring to innovate has made today's achievements of Guangbo. This spirit is worth encouraging and learning. At the following symposium, Wang Liping showed welcome to Wang Hao and his party. He introduced Guangbo’s development in recent years and the key planning in the future in details. He showed, in recent years, in the complex environment of internal and external environment, Guangbo always adhere to the high quality development route, and actively explore new path of transformation and upgrading. At present, it has achieved good results in new materials, fashion stationery, electricity providers and other fields. The next step it will continue to increase exploration, strive to achieve the comprehensive development of the industry as a whole. For Guangbo’s current achievements and future plans, Wang Hao expressed affirmation and approval. He pointed out, hope Guangbo guard against arrogance and impetuosity and increase the pace of transformation and upgrading, increase the intensity of reform and strengthen the depth of innovation and exploration, striving to create greater value for society.